Illumination by a tip of the thumb! The illumination intensity can be steplessly preselected and activated just by a tip of the thumb -also while aiming. 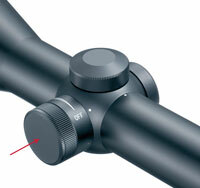 The pure design of the riflescope and the usability of the magnification adjustment are fully maintained for Isodot reticles in the second image plane.